Fast-track project completed under budget and two months ahead of schedule in spite of severe logistical restraints; over a million dollars in value engineering savings; increased ability to provide higher levels of patient care and comfort; state-of-the-art life safety technologies; non-disruptive project delivery; electrical support for state-of-the-art medical technologies. To equip an advanced 308,000-square-foot healthcare facility with complete electrical, security, life safety, and communications systems. Dynalectric's contributions to the client's new, eight-story Sue and Bill Gross Women's Pavilion began several months before electrical construction started. Working as a design/assist and value engineering partner with the general contractor, Dynalectric helped trim more than one million dollars from the initial budget and eliminate many potential field installation conflicts. The Dynalectric project management team was ready for the special challenges this project presented. One of the most difficult of these was the construction site itself, which was tightly surrounded on three sides by active hospital buildings with a busy hospital road on the fourth side. This meant contractors had virtually no staging or storage space. In fact, there wasn't even room to park a pickup. As a result, work crews and all of the electrical equipment and materials had to be transported in from off-site locations. Dynalectric carefully scheduled these arrivals to synchronize with a very aggressive electrical construction schedule that called for the company and its subcontractors to complete approximately 125,000 man-hours (14 man-years) of work in less than two years. Dynalectric provided the depth and expertise of its electrical construction services. Over the course of the project, the company's expert technicians installed 17 switchboards, 3 motor control centers, 18 transformers, and 146 panel boards. They also made major modifications to owner-provided switchgear, adding circuit breakers, meters, and other devices. In addition, the Dynalectric team put in more than 140 types of fixtures — over 7,000 in all, many with custom designs — as well as approximately 5,000 wiring devices and over 8,400 tele/data, fire alarm, nurse call, master antenna television, intercom, and facilities security devices. Furthermore, Dynalectric crews installed nearly 700,000 feet of branch conduit and 50,000 feet of feeder conduit, 22,000 feet of which measured four inches in diameter. By the time the project was completed, the conduits contained more than 300 miles of branch wire and nearly 31 miles of feeder cables. As work progressed, the Dynalectric team also responded to over 8,000 RFIs (requests for information) and almost 12,000 correspondence items related to building construction solutions. Yet, in spite of all the challenges, the project was completed two months ahead of schedule without disrupting the hospital's daily activities. 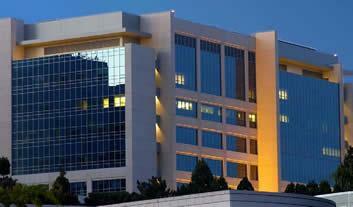 Hoag Memorial Hospital Presbyterian is a 498-bed, not-for-profit acute care hospital located in Newport Beach. It has centers of excellence in cancer, heart, orthopedics, and women's health services. Construction of the Sue and Bill Gross Women's Pavilion nearly doubled the hospital's clinical space. Designed specifically for patient wellness and family-centered care, the Pavilion has 18 state-of-the-art labor and delivery suites, three operating rooms solely for cesarean sections, and a seven-bed antepartum unit to meet the needs of expecting mothers. The maternity unit includes 42 private rooms and a 21-bassinet neonatal intensive care unit. There is also an ambulatory procedure center with six operating rooms, two 41-bed nursing floors for surgery patients, and seven endoscopy procedure rooms. In addition, the hospital includes dedicated health and wellness resource centers, laboratory services, and patient registration and education facilities.